Asking Boldly. Even before the request is revealed, the very sound of the question seems brash: “whatever we ask.” It is as though they want a “blank check” from Jesus. Is it enthusiasm? Is it brazenness? Is it coming from a sense of “I deserve a reward for having followed you these many, many months?” Is it arising from a sense of “I have looked at the other 10 and we are the ones you should pick?” Hard to know, but in any event, Jesus simply asks them what they desire. The half-empty version is that Jesus is ever making things “clear” but the disciples – and especially the Twelve – remain blinded by their earthly expectations. Perhaps they only see as far as Jerusalem and the throne to be ascended is David’s. Their vision is the royal, conquering Messiah who will return Israel to it glory days of 1000 years past. The brothers are simply seeking rank and privilege. The place of honor is the seat on the right, and next to it, the seat on the left (cf. 1 Kings 2:19; Ps. 110:1; and in non-biblical sources, 1 Esdras 4:29; Josephus, Antiquities VI. xi. 9). It seems almost impossible that these two disciples could ask such an ambitious and inappropriate question after Jesus has been describing his way of suffering so clearly since 8:31. 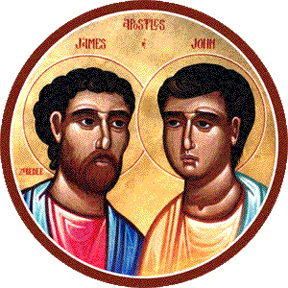 It is interesting to note that Matthew casts James and John in a better light, having their mother pose the request in Matt 20:20. Still, this incident reveals that in spite of Jesus’ repeated efforts since Peter’s confession at Caesarea Philippi to let them know the cost of discipleship, the sons of Zebedee have understood his intention only superficially. Their ambitious request brings question upon their commitment and discipleship, while the resentment of the other ten disciples reflects a similar preoccupation with their own dignity. Mark 10:32 on the way . Jerusalem as the destination of the journey is made explicit in Mark 10:32. In the Greek, hodos, (vv. 17,32) is more literally translated as “the way.” Some who argue that this simpler translation is better suited to the verses as it takes on a figurative meaning of one’s “way of life.” Even more specifically, hodos became a title for the believers in Christ, “who belong to the Way” (Acts 9:2; also Acts 18:25, 26; 19:9, 23; 22:4; 24:14). Mark 10:37 right … left: Mark uses two different words for “left” (aristeros in v. 37 and euonumos in v. 40). They are synonymous. Matthew uses eunonumos in both places in the parallel passage (20:21, 23). Mark uses the second word for the bandits at Jesus’ right and left at the crucifixion (15:27) as does Matthew (27:38), but Luke uses aristeros for the position at the crucifixion (23:33). When there are people at Jesus’ right and left in Mark, they are bandits and it is at their crucifixions. Is that the time of Jesus’ glory? Are they the ones for whom God has prepared the honor? This entry was posted in Scripture and tagged discipleship, glory, Mark 10:35-45 by Friar Musings. Bookmark the permalink.